Assistance League of the Triangle Area is proud to partner with the following members of the community. We greatly appreciate their contributions in making our organization and our programs successful. 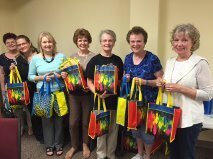 Prepared Summer Survival Kits for distribution to women in crisis. Provides the man power to load and unload the trucks. This allows us to efficiently pick up furniture and various other items for our A-Z Thrift Shop. Provides truck to pick up donated items for our A-Z Thrift Shop. Supports our A – Z Thrift Shop through their Community Outreach program.